Aeris Williams is a physical ballcarrier that will make a team pay for selling out against Nick Fitzgerald. Georgia has Nick Chubb, Sony Michel, and D’Andre Swift. Jeffery Simmons has been the back-to-back SEC Defensive Lineman of the Week. Georgia has Trenton Thompson, a deep pool of defensive linemen, and some of the best pressure off the edge in the league. Keith Mixon is a dangerous slot receiver capable of big plays. Georgia has Terry Godwin, an experienced and versatile receiver who can turn short passes into big gains. Nick Fitzgerald has developed into a confident dual-threat quarterback. I give him the edge over Jake Fromm if only because of experience. Fromm is starting his first SEC game on Saturday, and conference play is now old hat for Fitzgerald. Fitzgerald seems to be a good fit for Dan Mullen’s system. We’ve heard all week about Mississippi State’s standouts on both sides of the ball. They’re legitimate and are playing at a high level right now. But Georgia won’t have a talent deficit on Saturday. It will be a test for Kirby Smart’s coaching and program development against an established coach with a known identity and scheme – a coach some preferred over Smart. Mullen’s best chance to win Saturday is for his scheme and playcalling on both sides of the ball to overcome Georgia’s (however slight) advantages in overall talent by exploiting the areas where Georgia is weakest. Smart won’t be outcoached as badly as Ed Orgeron was a week ago, but Smart and his staff will have to match wits against one of the SEC’s longest-serving coaches to allow Georgia’s talent to win the day. Was 3rd-and-Grantham really a thing? Have you heard? Todd Grantham is returning to Athens this weekend. I’m nothing if not a sucker for a good storyline, and this one…rates about a 2 out of 10. Still, all of this Grantham returns! coverage got me wondering whether “third and Grantham” was a legitimate gripe or just more “run the damn ball Bobo” blathering where confirmation bias magnified any third down conversion. How did Grantham’s defenses really rank on third down? So, yes, Georgia’s defense was excellent on third down in 2011 and decent in 2012, but they were decidedly average or below-average in Grantham’s other two years in Athens. The slide from 3rd to 37th to 64th on third down didn’t do much to quash the “third and Grantham” meme. In the eyes of many fans, his departure after the 2013 season just saved someone from making a decision a year or two later. “Third and Grantham” didn’t just come about because of third down conversions – it was about third and long. Is there anything behind that? For answers we can look at opponents’ performance on passing downs. (Stats are from Football Outsiders who define Passing Downs as “second down with 8 or more yards to go or third or fourth down with 5 or more yards to go.”) In other words, how well does the defense do when they might reasonably be expecting a pass? Grantham’s defenses were never (relatively) terrible in those situations and were never ranked worse than 47th on passing downs. At the same time, with the exception of Grantham’s first year in 2010, the defense’s performance on passing downs was worse than on standard downs. In 2012 and 2013, it was much worse. When you do a fairly good job on standard downs to set up longer conversions, you expect to be in good shape to get off the field. That didn’t happen. Again, Georgia did better than most on passing downs, but they were relatively weaker in those situations than on standard downs. In 2013, Georgia allowed conversions on nearly 40% of third downs and ranked in the mid-40s on passing downs. It’s clear why the “third and Grantham” meme that appeared during his first season really took hold towards the end of his time in Athens. Did “third and Grantham” come along to Starkville? Not in the way we think of it. The MSU defense has been impressive on third down in 2017. They are currently among the top ten in the nation, allowing conversions on just 21.4% of third downs through three games. Their defensive success rate on passing downs is 10.7%, good for 4th in the nation. When you’re that adept at stopping drives, you give your offense more possessions, and it’s no surprise then that MSU is among the highest-scoring teams in the nation. If Georgia wants to slow Fitzgerald and his productive offense, there isn’t a much better solution than maintaining possession and moving the chains. Georgia’s challenge on offense is to find success against a defense that has, so far, made “third and Grantham” something to anticipate rather than dread. Comments Off on Was 3rd-and-Grantham really a thing? Yawn. “Yawn” is good in games like this, right? No one will shudder or cringe when they mention the Samford game (if they ever mention it again at all.) “Samford” won’t become a one-word cautionary shorthand the way Nicholls did. Unless you’re Terry Godwin pulling up the highlights years from now to relive the glory days, it was a forgettable game that will serve mostly to increment whatever Georgia’s win total ends up to be. The game wasn’t without its drama. The clumsy second quarter sequence with a Samford touchdown and Georgia fumble could’ve made things interesting, but Georgia kept their poise, made plays on defense and special teams, and dominated the rest of the game. 1) It was telling that Georgia’s first play of their second series was a successful toss out of the shotgun to Chubb. Interior runs were stuffed on the opening drive (especially on the fourth down attempt) as Georgia’s inside trio struggled against an FCS defensive front. Not good. Chubb of course was productive with a little space, and the Dawgs got good blocking from the tackles and receivers. Is this the way forward? Chubb’s power style is at its best when he can get a little head of steam, and it’s tough going sometimes getting through the logjam on the interior. Even on designed inside runs, Chubb is at his best when he can bounce outside. In the bowl game last year we saw outside runs from the pistol devastate TCU in the fourth quarter. If teams are going to load the box against the run, Georgia’s going to have to look to the perimeter on both run and pass plays. The advantage was exaggerated against the level of competition last week, but you like the odds with Chubb, Michel, Swift, or Godwin in space with one man to beat. On the other hand, we often hear about those early inside runs acting as body blows that pay off later as the defense softens, and Swift in particular has a little better burst through the line than Chubb. Inside or outside, Georgia’s offensive line will have to deal with Jeffery Simmons. 2) A Chris Hatcher offense can tell you a lot about your pass defense. Georgia’s secondary more or less held up well, but they were aided by a few key drops and the pass rush. McGhee was picked on, sure, and a competent quarterback like Samford’s can find a weakness and continue to attack it. It was more than McGhee though. LeCounte continues to learn on the job, Reed had a few lapses, and a well-thrown ball beat Davis on their second touchdown with LeCounte unable to help in time. Still, 6.5 yards per attempt isn’t a poor day at the office against an offense that likes to throw it around. Georgia did well, with only a few lapses, at getting third down stops (Samford converted 4 of 11 third downs) and limiting the number of plays run by the visiting Bulldogs. Jake Fromm’s ability to lead the team on the road into that environment was one of the big unknowns entering the game. Further, regardless of the setting, how would he handle his first taste of adversity? His debut was in almost perfect conditions – he was at home, against an overmatched opponent, and the team was able to play in possession of the lead for the entire game. The conditions Fromm faced in Notre Dame game turned out to be nearly opposite. He was on the road, the opponent was more or less an even matchup, and Georgia played from behind for all but a few minutes. Ignoring individual plays and decisions, I think that’s what impressed me most about the game. Georgia came back from a deficit four times. I think that’s where Notre Dame’s All-American offensive tackle Mike McGlinchey was coming from when he said, “We had them, for the most part, where we wanted them all game.” Notre Dame, a home favorite, had the lead for much of the game and forced a shaky offense with a freshman quarterback to answer not once, not twice, not three times, but four times. Who wouldn’t think they held the upper hand under those circumstances. Will this go down as one of the great fourth quarter comebacks? Should it? I guess it will depend on how the rest of the season goes. This might be hindsight talking, but things never seemed that dire. Tense, anxious, and frustrated at times, sure, but I didn’t sense that Notre Dame controlled the game even as they maintained a close lead. Maybe the three earlier answers gave us confidence that Georgia had one more push in them. Perhaps the defense limiting the deficit to no more than six points kept the panic from taking over. As the defense forced field goal after field goal, you saw Notre Dame waste several opportunities to put Georgia in serious trouble and leave the door open for Georgia to tie or take the lead. The Bellamy forced fumble, Wims using his size to set up the winning field goal, and Blankenship knocking it home were the highlights of the comeback. I’ll remember two additional plays. Before Georgia could drive for the win, they had to get the ball back. Notre Dame had possession and a two-point lead, and they faced a 3rd-and-3. Brandon Wimbush kept the ball and looked to have room around the left side to move the chains. Natrez Patrick shed his block and forced Wimbush further outside. J.R. Reed charged in from his safety position to stop Wimbush short of first down yardage, forcing a punt that led to Georgia’s game-winning drive. That drive started well enough with a 12-yard run by Chubb and a quick 8-yard pass to Nauta. Chubb was stuffed on second down, setting up a 3rd-and-1 near midfield. Sony Michel averted a disaster. Fromm faked the fullback dive and pitched to Michel. Notre Dame defensive end Daelin Hayes stayed home and was in position to stop Michel behind the line. Sony made a quick cut to the right to avoid Hayes and sustained the drive. Had Hayes made the tackle, Georgia would have faced a 4th-and-6 and likely would have punted with about 5:45 remaining. Even with the cut, Hayes got enough of the ball to knock it loose, but Michel recovered and finished the run. Fromm found Wims on the very next play, and Georgia was in position to take the lead. There were so many of those individual moments in this game. Some had more frequent (Carter) or more spectacular (Bellamy, Godwin) moments than others, but it’s really tough to try to list them without feeling as if you’re leaving someone out. Roquan Smith was everywhere. LeCounte’s pass breakup was a sign of things to come for a talented freshman. Sanders made a touchdown-saving play on the game’s first snap. Thompson, Clark, and Atkins disrupted a very good offensive line so that Smith and the other linebackers had room to operate at full speed and make plays. Yes, the defense was outstanding (with the exception of penalties.) I was surprised Notre Dame didn’t do more to counter Georgia’s speed and aggressive pursuit. A successful screen pass was key in setting up their touchdown, but we saw few plays like that – screens, quick passes to neutralize the pass rush, reverses to catch the defense going the wrong way, and similar tricks we’ve all seen coaches use to slow down an aggressive defense. They stuck with the read option plays that could be contained and funneled to the inside, and their pass plays often took long enough to develop that Georgia was able to tally far more QB hurries and sacks than they did in the opener. I expect future opponents who have the benefit of this film to be a little more deliberate about trying those countermeasures against Georgia’s defensive strengths. I want to touch on one play on offense because it brings together a few themes that were a big part of the preseason and early season discussion: the running game, involving the tight ends, Fromm’s inexperience, and RPOs. When we talk about RPOs, we’re often thinking about a quarterback who’s a credible threat to run. Fromm might have a little more mobility than Eason, but I doubt coaches want Fromm taking any more hits than he already does. He didn’t run the ball on any other read play when he could have easily gained some yards. So why, as on the second quarter fumble, would Fromm pull the ball back from the tailback as if he were going to keep it? Against Appalachian State, one of Fromm’s earliest completions was a quick-hitting 16-yard pass to Nauta down the seam after showing a handoff to Chubb. On the play that resulted in the fumble, again Nauta is releasing vertically while Fromm looks to hand the ball to Chubb. Even if Fromm isn’t a threat to run himself on either play, he still has two options: the straight handoff to Chubb is always there if the line shows a certain look, but that handoff option can have the same effect as play action. The option here isn’t run/keep; the option is handoff/pass. If the defense reacts to the run threat, Nauta is available down the seam. 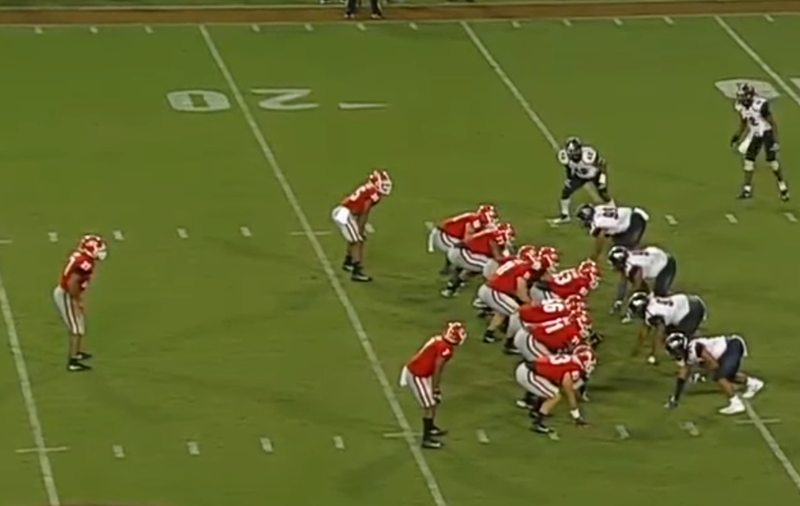 I think on the fumble we saw a misexecuted RPO rather than Fromm looking to take off running. As a fan, I couldn’t have been happier with the weekend. It was an unforgettable trip, and the Dawgs won. As an observer of this team, I’m holding off talking about any kind of statement. It was a road win over a ranked team, and those are tough to come by. Hopefully the team found some things to build on and take into SEC play. But as a defining moment, it felt a lot more like a slightly better version of last season’s Auburn game. You were relieved to get the win, but the performance of the offense was sobering enough to take the edge off of a defensive highlight reel. It’s been a rough week without power and internet access since we returned from Chicago and South Bend, but I wanted to get a few posts out about the trip. Our group arrived Thursday, and the flight up was reminiscent of earlier trips to Tempe and Boulder. Georgia fans in good spirits (and drinking good spirits) filled the plane, and that became a commonplace sight throughout the trip. We used Chicago as our base and did the Cubs/Dawgs/Falcons triple-header. For several of us, it was a once-in-a-lifetime experience to check off three of the most iconic venues in sports. It looked as if we weren’t alone, and many smiles, “Go Dawgs!”, and even a few barks were exchanged with thousands of fans throughout the weekend. The experience of being a Road Dawg is a treasure. It’s not always inexpensive, and it can be tough to leave family and other obligations for a distant football game, but it’s almost always worth it. I hope every dedicated Georgia fan can experience a big road game. I was impressed with the folks behind the Dawg Days events in which thousands of fans participated. I can only speak for my group’s experience, but everything went smoothly – pre-event communication, registration, transportation, and of course the events themselves. It was a well-organized operation, and it even handled the sudden Cubs’ time change. Of course drink and bathroom lines can always be shorter, but that’s a fact of life when you offer free beer to Georgia tailgaters. That brings us to the game and the campus. $400 million buys you some nice stadium improvements, and it showed. The exterior facade of the stadium blended into the surrounding buildings. Wide concourses had almost a vintage feel, modernized with all of the conveniences. It’s natural to compare the results of this renovation with the needs of Sanford Stadium, but that’s a whole other post for some offseason. A friend called it “Masters Football.” The stadium wasn’t lit up with marquee boards, there was no find-the-leprechaun-behind-the-french-fries game, and in-game messages highlighted faculty achievements and other points of pride. The only blemish was piping in music, especially on opponent third downs, but that’s kind of a given now. (And with several of the music selections Atlanta hip-hop, perhaps they were just trying to make us feel at home.) The campus of course was immaculate with nearly every Georgia fan seeking out a photo opportunity in front of the Golden Dome or Touchdown Jesus. The quantity of Georgia fans in South Bend shook a lot of us. Even Georgia fans who expected a large turnout were overwhelmed and didn’t expect it to be that big. I was giddy and immensely proud of the turnout, and I’m relieved that we left a fairly good impression. I don’t blame Notre Dame fans for being put off by an opponent taking over their stadium, but I agree with Michael that the Georgia turnout should be considered the highest compliment to Notre Dame. I don’t know that as many Georgia fans would travel to Penn State or Nebraska, though we’d have an above-average showing as we did for Arizona State and Colorado. Regardless of Notre Dame’s current relevancy, college football fans have to acknowledge the program’s place in our history. Most any program’s DNA has some common threads with Notre Dame whether it’s directly (Harry Mehre) or indirectly (Vince Dooley). If you want to go deeper than I care to here, you can explore Notre Dame’s embodiment of northern college football or even dive into Savannah Catholicism. For whatever reasons, we had to be there. A fun city like Chicago nearby added to the appeal, and the opportunity to take in Wrigley Field and Soldier Field as well as Notre Dame made the trip a must for me. Seeing the red was impressive enough, but the lights during the fourth quarter fanfare took your breath away. The colors were tough to pick out in far corners of the stadium, but there was no mistaking the breadth of the individual lights from nearly every section of the stadium. There were audible gasps, and you can hear the roar growing from the Georgia fans as they realized the magnitude of the Bulldog presence. I heard a Notre Dame observer on the WSLS podcast talk about how demoralizing that moment was for the home crowd, and I wonder what it did for the teams. Georgia’s players and coaches have been effusive with their praise for the road crowd, and I would bet that it took a little wind out of the sails of the home team. I’ve been a proponent of keeping these big games on campus, though I realize it’s swimming upstream agaisnt the money to be made from neutral site games. Kirby Smart has expressed his preference for the big neutral site games. Fortunately this home-and-home was negotiated before the coaching change. It’s a fact that the interests of the fans don’t always align themselves with what’s best for the team. Georgia could have simply scheduled another lightweight home game as they will in 2018. Speaking for my wallet, a trip of this magnitude isn’t workable every year or even every other year (especially if Jacksonville is an annual ritual,) but I’m already looking forward to UCLA in 2025. Perhaps the rarity and uniqueness of these games make them so desirable. I don’t know that I would have gone to this game in, say, Dallas. I’m selfishly glad they took the risk to play this series. I should close by commending everything about Notre Dame. From Chicago to South Bend, ND fans were cordial, welcoming, and gracious. Campus ambassadors and game day staff went looking for ways to help and point us in the right direction. There was some bantering of course, and maybe Notre Dame fans are more subdued than usual these days, but I hope they have at least half as good a time in Athens in 2019 as we did last weekend. “Year 2” was a common offseason theme. Kirby Smart was entering his second year as head coach. Jacob Eason was entering his second season as the starting quarterback (get well soon!) It was natural that we saw countless “Year 2 effect” stories pointing out how well a coach or quarterback did in his second season relative to his first. With Smart, it was exciting to think about how Mark Richt took an 8-4 team in 2001 and produced an SEC champion the next year. Smart’s association with Alabama and Nick Saban reminded us that Saban’s 7-6 squad in 2007 improved enough to post an undefeated regular season in 2008. Eason can’t seem to escape Matthew Stafford comparisons, and so we looked to 2007 and Stafford’s second season as the starting quarterback for what we might expect of Eason after one year leading the offense. Within a single season, the second game gets similar treatment. The claim that “teams usually make their biggest improvement between the first and second games” has been repeated enough that we accept it as a fact and an inevitability. The second game hasn’t always been so kind to Georgia. We only have to go back a season. We felt good about overcoming a decent North Carolina team, got giddy over Nick Chubb’s return, and saw the promise of a talented freshman quarterback. Then came the horror of the Nicholls game. Since we brought up 2007, remember how it began. Georgia had an impressive win over Oklahoma State in the opener, and Stafford was productive and efficient leading the team to a comfortable win. That was followed up by an ugly 16-12 loss to South Carolina – a game in which the offense failed to reach the end zone for the first time in six years. That loss ended up keeping Georgia from a shot at SEC and national titles in 2007. Surely Saban had it easier? The second game of his turnaround 2008 season was an unconvincing 20-6 win over Tulane that featured only one offensive touchdown. The Tide had a dominant eye-opening win over Clemson in the Georgia Dome to start the season, but even this team that would head into the postseason without a loss couldn’t avoid a Game 2 hangover. Georgia enters Game 2 of 2017 focused as much on survival as improvement. We hope the offensive line takes a step forward with Solomon Kindley’s return. The many true freshmen who played in the opener should also be past their first game jitters and can iron out some of Saturday’s mistakes. The team’s biggest priority though is preparing Jake Fromm for his first start. It’s tough to expect wholesale improvement as the team has had less than a week to prepare for Notre Dame while scrambling to get Fromm and his backups as much work as possible. Since Fromm looked comfortable and confident in the opener, I’d expect that he’s faced everything but the kitchen sink this week in an attempt to rattle him and see how he responds. We’ve seen some impressive season openers before, but it’s not often that Georgia has faced a Game 2 of this magnitude. You have the novelty of the Notre Dame trip, a road game as the underdog, the challenge of a Top 25 opponent, and you’re placing the offense in the hands of a true freshman. That would be enough for an entire offseason of preparation; now you’re doing it within the normal parameters of just another game week. If Georgia is able to sustain the level of play from the opener while showing improvement in light of the major shock to the system of losing Eason, this Game 2 could open up some big possibilities for the rest of Year 2. Saturday’s season-opening 31-10 win over Appalachian State was an unremarkable drama-free win by a top 15 program over a quality mid-major team, and it barely moved the needle beyond Athens. In other words, it was a novelty. The past two seasons of home games have been less pleasant than pulling teeth, so Saturday’s win was a much-needed release for the Sanford Stadium crowd. After the slow start and the early injury to Jacob Eason, Georgia’s defense bought time for a freshman quarterback to come off the bench and build a comfortable lead by halftime. It was, dare we say, fun to watch. The weather was perfect, the crowd was engaged, and damn near the entire roster saw the field. After hearing all week about Michigan 2007, Nicholls, and the fact that Georgia hadn’t won a game by more than 14 points in almost two years, it was a welcome and refreshing sight to see a dominant win. Georgia’s strongest unit was, as expected, the defense. When you have that much talent, experience and, presumably, decent enough coaching, it should show up in the results. The Bulldog defense was stingy on the interior, and Appalachian State’s tailbacks weren’t much of a factor. Georgia’s pass defense was equally effective, holding Appalachian State to under 5 yards per pass attempt. The good news is that the defense can be even better. The base pass rush can improve – one of Georgia’s two sacks came on a safety blitz, and the team recorded zero quarterback hurries. Appalachian State’s most effective running plays were by the quarterback on read option plays, and that discipline on the edge will have to be better against a Notre Dame quarterback that rushed for over 100 yards. There was the occasional breakdown in pass coverage, and that’s to be expected with so many inexperienced defensive backs playing large roles. If this is the reference point though, this could be a fun defense to watch. Less expected was the special teams performance. The return units didn’t have much to do – kickoffs were sparse, and punts were often fair catch candidates. Georgia’s kicking though was eye-opening. Cameron Nizialek was a true weapon as the punter. His usual punts were good enough, but twice he was able to pin back Appalachian State inside their own 10, and that field position helped to set up a very short field for Georgia’s first score. Thanks to good hangtime and good speed on the coverage team, no Georgia punts were returned. Rodrigo Blankenship was true on a short field goal attempt but really showed progress on kickoffs. I want some of what got into his leg in the offseason. The one kickoff that was returned was snuffed out inside the 20. So add good defense and special teams, and you have Kirby Smart’s ideal: an opponent forced to drive the field and the occasional good field position for your own offense. Three of Georgia’s four touchdown drives began beyond the Georgia 30. Georgia’s advantage in field position was such that the defense could afford infrequent long runs or passes by Appalachian State and still have plenty of room to recover. Mix in an offense that eventually found ways to move the ball, and you have all three phases of the game contributing. The result? Points on five out of six drives and a lead that grows to a comfortable margin. On offense, of course the quarterback situation has to dominate the discussion about the offense. Eason didn’t have a strong start and overthrew Nauta, but the playcalling was also fairly restrained on those opening drives. Before we get to Fromm’s performance, I have to commend the preparation of both Fromm and the coaches. It helped that he was an early enrollee, but Fromm was poised and put into situations where he could gain confidence. It’s standard now to compare Fromm and Murray as we do with Eason and Stafford, but Fromm wasn’t without his Stafford gunslinger moments. You couldn’t see that sidearm pass he threw in the third quarter without thinking about some of the unconventional fearless (if not occasionally ill-advised) throws Stafford became known for. So what do we have in Fromm? We know the leadership qualities are there, and we know he’s not afraid to make most any throw. His arm isn’t what Eason’s is, demonstrated by the trajectory of some of his deeper passes. He might be a quick study in the film room, but coaches won’t feel comfortable using as much of the playbook as they might otherwise have. Of course he’ll likely make a poor decision or two as he sees more pressure from better defenses. We didn’t see him flushed from the pocket much, but he’s supposed to be a little more mobile than Eason. (That said, how much do we want him scrambling without a viable backup?) What seems to matter most is that he has buy-in from his coaches and teammates. Even former players noticed it and commented on it during the game. Those around him and those who have been in the Georgia program recognize someone capable of running and leading the offense. That’s good enough for me. A turning point in a game like this? It was early, but J.R. Reed’s sack and forced fumble came at an important moment. Taylor Lamb ripped off a long run into Georgia territory, and Appalachian State threatened to post the first points of the game. Reed came off the right side, got off a block as he kept his eyes on Lamb, and then charged the quarterback at a sprint to force the fumble. The loss of over 20 yards killed the drive. Georgia didn’t score on their next possession, but Nizialek punted the ball inside the 10 and set up the field position that would result in Georgia having only 40 yards to go for their first points. Reed was just one of several newcomers to have impressive debuts. LeCounte played most of the game and survived his trial by fire. Swift was used both at tailback and in the slot and showed promise. Fromm’s two best throws might’ve been on Georgia’s first scoring drive. First was the quick pop down the seam to Nauta that Isaac caught in stride. Next was the completion to Wims to set up Chubb’s touchdown. The ball was placed perfectly between defenders and settled into the hands of Wims. Fromm had his share of questionable throws, but those two early passes showed a special ability. Was Fromm’s pass to Nauta an RPO? There was certainly a fake to the tailback that helped to create space for Nauta. Was there a run option built into that play? Things we didn’t see? Tailbacks weren’t involved in the passing game. Swift caught three passes, but he often lined up in the slot, and only one of those receptions came from the backfield. No need to show those elements yet. We also didn’t see many of the jet sweeps or “Isaiah McKenzie” plays that were so effective last year. Certainly there was some motion, but it was almost always a decoy. Kudos to the UGA staff for $2 water until 6:00. A nice plus for people who are in the stadium early. I rarely visit the concessions, so most of the improvements were lost on me, but the water deal was one of those little things that you appreciate after a walk over from tailgate. I’ve seen more predictions than not giving Appalachian State 17 or 20 points. It’s understandable – I respect their running game. I respect their senior quarterback. But if Georgia is giving up in the neighborhood of 20 points to a non-P5 opponent, it tells me that Georgia’s defense isn’t what we think it is. With so many returning starters and contributors in their second year in the system, there shouldn’t have to be much of a readjustment period for the defense. If we’re using last year’s Appalachian State-Tennessee game as a cautionary tale, the Vols’ problem was an offense that took the better part of three quarters to get going. Tennessee held the Mountaineers to 13 total points and shut them out in the second half, and as we saw in Athens, it wasn’t the most dominant Tennessee defense. Appalachian State managed just ten points at home against Miami. Should we expect as much from the 2017 Georgia defense? I’d like to see this opponent held to no more than ten points. It’s an ambitious target given the quality and experience of the offense we’re facing, but the defense is supposed to be the lynchpin of the 2017 team. Let’s challenge them. A low score for App. State would also imply that other areas of the Georgia team are pulling their weight. The offense isn’t creating a short field via turnovers or three-and-outs. Special teams isn’t shanking punts or giving up long returns. It would also tell us whether Georgia’s red zone defense has improved. It would truly be a team effort to hold the Mountaineers under 10 points, and I include the reserves in that goal. Last year against ULM Georgia coasted to a 35-7 lead. They gave up consecutive touchdowns in the final five minutes to close the gap to 35-21. Those touchdowns were meaningless in the outcome, but fourth quarter misadventures were part of the story way too often in 2016. Finishing a complete game has to be a team mindset, and hopefully we’ll get to see how even the true freshmen handle it. Again, if we’re looking at their opener against Tennessee last season, the bigger challenge should be for Georgia’s offense. We can expect the same compact look we saw from every defense last season in an attempt to stop the run first. We’ll see what new weapons are available to stretch the field in the passing game. We’ll see if Eason can trust his protection and become a more accurate and efficient passer to sustain and finish more drives. We’ll see if the coaches can continue the creativity they showed in the bowl game with Michel catching passes out of the backfield or the tailbacks gashing the defense on outside runs late in the game. There’s a lot more uncertainty about the offense, especially with several inexperienced linemen making their first starts. Appalachian State’s formula for keeping this game close isn’t a shootout; it’s a low-scoring ugly game similar to the 13-13 regulation draw in Knoxville a year ago where a single turnover, busted defensive play, or field goal could turn the game. 17 or 20 points on their side would be enough to keep them in the game. It’s the job of this experienced and talented defense to make things a little more comfortable as the offense finds its way.